Extra fenders are always handy and a Fender Step provides that bit of extra protection while also giving you an easy step onto and off of your boat. 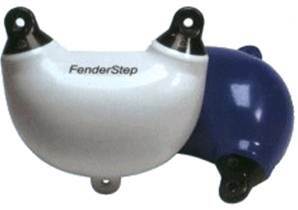 The Fender Step has solid eyes for strength. 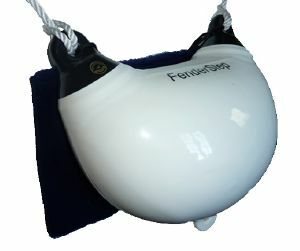 The fender inflates to about 24cm, wide enough to put your whole foot on. Non-slip surface on step area for safety. Rope holds positioned so that the step will not swing sideways. 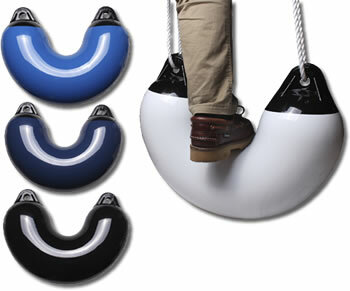 Made from marine grade PVC, inflated with a normal airline via the brass valve. Comes with a free adaptor for inflation. Can be put in place as an ordinary fender before entering the marina enabling Captain and crew to step ashore and climb aboard safely! Inflates to around 24cm width. Solid Rope Holds for strength. The brilliant, versatile Arc Fender can be used as a Step Fender, a bow fender and is excellent for rafting and stern-to mooring as it will stay in position and not roll out of the way. The black rope eyes are solid for strength which is a important if it is being used as a step. 54cm wide x 43cm high x 20cm deep. 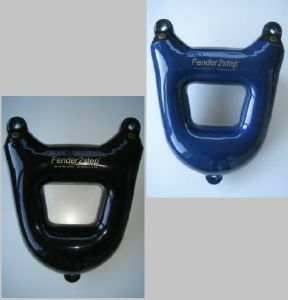 Made from the same tough material as our Fender Covers our Fender Step Mat stops scuff from feet on topsides. To fit simply tie to the eyes of the step and drop down behind. This is only the MAT not the STEP. Made from the same tough material as our Fender Covers our Fender 2Step Mat stops scuff from feet on topsides.